This attraction is arguably the world's best and largest RMS Titanic Exhibition in the world The building is fast becoming a world recognised symbol of Belfast and its maritime hertitage which includes many world class vessels the most famous of which was the ill fated liner RMS Titanic built on land once owned by the shipyard that built it, Harland & Wolff. The Titanic building, designed on all sides to represent the grandeur of RMS Titanic is located on Queen's Island which is now for the most part referred to as Titanic Quarter. The story of the ill-fated liner is now synonymous with Belfast and the city's maritime history is always brought to remberance of locals and tourists with its two most famous residents visible from all quarters, the Harland & Wolff cranes Samson and Goliath, named after biblical characters Goliath for size and Samson for strength. The Titanic experience recreates scenes from Belfast at the time when RMS Titanic was built (1909 - 1911). It portrays the ship's launch into Belfast Lough which was watched by about 100,000 people. The exhibition presents a 360 degree computer generated tour around the ship and its various classes of travel. Then comes the ship's disastrous maiden voyage, the iceberg strike, its subsequent sinking and the aftermath. The galleries finally look at the legacy of the disaster and the discovery of RMS Titanic on the floor of the North Atlantic. 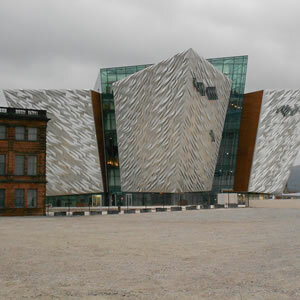 Titanic Belfast is the city's top attraction and a must if visiting the city. 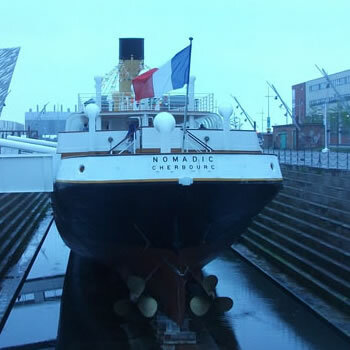 The next step on your Titanic journey has to be the SS Nomadic which has now been fully restored and which sits proudly in the dry Hamilton Dock, Queens Road, Titanic Quarter, just yards from Titanic Belfast. The SS Nomadic was originally built alongside the world famous RMS Titanic 1911 and its purpose was to transfer first and second class passengers from the shallow waters in Cherbourg to join Titanic on its maiden voyage. SS Nomadic was vital as the shallow waters meant Titanic has to be anchored in the deeper water just off the coast. No doubt the journey out to RMS Titanic was seen as a little bit of luxury prior to the main event. The SS Nomadic is the last remaining White Star Line ship anywhere in the world and has become a vital part of the Belfast Titanic experience, becoming a major city attraction and you'll find the temptation not to go onboard and examine the luxury of the early 1900's, hard to resist. As part of centenary events to mark 100 years of RMS Titanic, the city of Belfast has created the Titanic Memorial Gardens in the grounds of city hall. 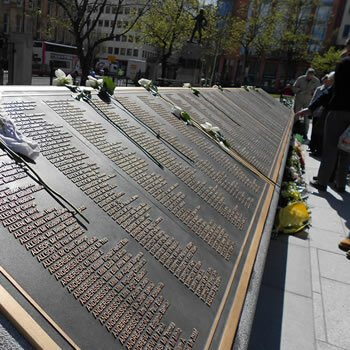 The city already has monuments to mark the sinking of Titanic but the gardens which were opened on the 15th April 2012 and which are situated on the eastern side of Belfast City Hall now hold all the names of those lost when RMS sank to the floor of the North Atlantic. All 1,512 names of those who perished on RMS Titanic that night are now inscribed on the garden's memorial plinth with its 15 bronze plaques. It is here that you will find the names listed in alphabetical order. This list also called the Belfast List and available for download from the city council's website, is the first time that the names of all who perished have been recorded on one monument anywhere in the world. In remembering the legend of the RMS Titanic it is important to remember all those who lost their lives and these gardens allow all visitors and tourists to Belfast to take a liitle time to reflect..